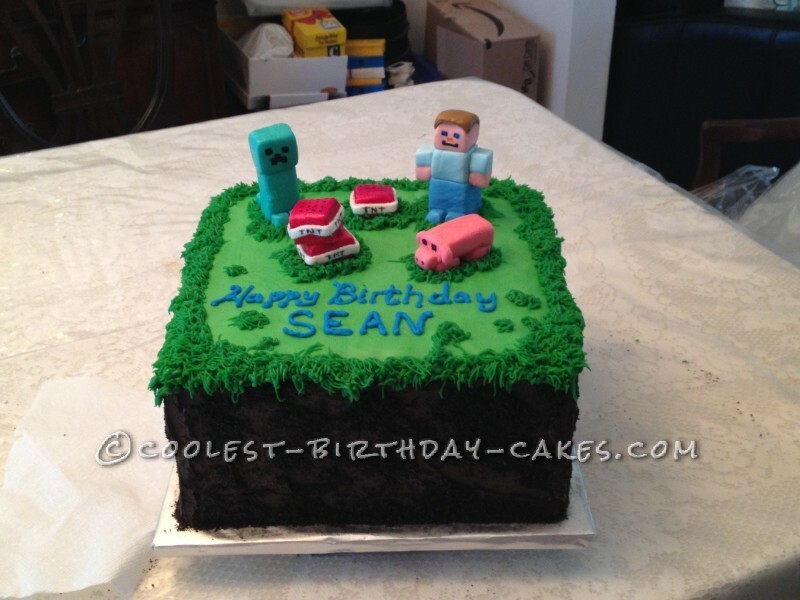 A dear friend asked me if I could make a Minecraft birthday cake for her son who was turning 6. She said she had looked and asked many places but couldn’t find any one who could make her such a cake. Not knowing what Minecraft was I set to researching it. I found some examples and discussed with her what their preferences where. All chocolate and of course it needed to have the important characters from the video game. The birthday boy did some searching on Pinterest and decided on a design. I made two 12″ layers and trimmed a half inch off of all the sides to make the corners sharper. Then I sliced each layer in half to make 4 layers . I made chocolate butter cream icing to frost between layers and outside of cake. After putting on the crumb coat I let the cake chill down in fridge. I then made a marshmallow fondant…so easy and tastes much better than store bought. I colored portions of the fondant for the characters I was making. 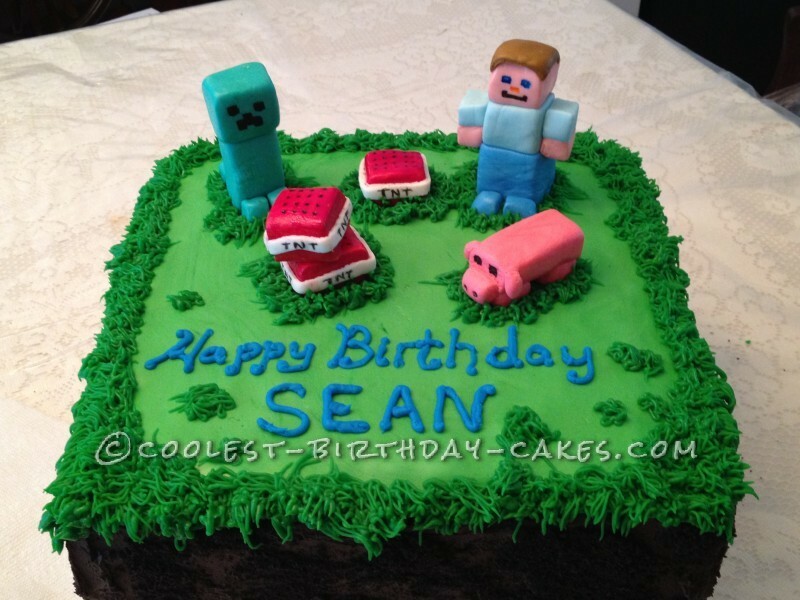 I then made my characters so they could dry a bit before placing on the cake. I then frosted the outside of cake and pressed ground Oreo cookies into it to resemble dirt. I then rolled a sheet of green fondant and placed on top of cake. 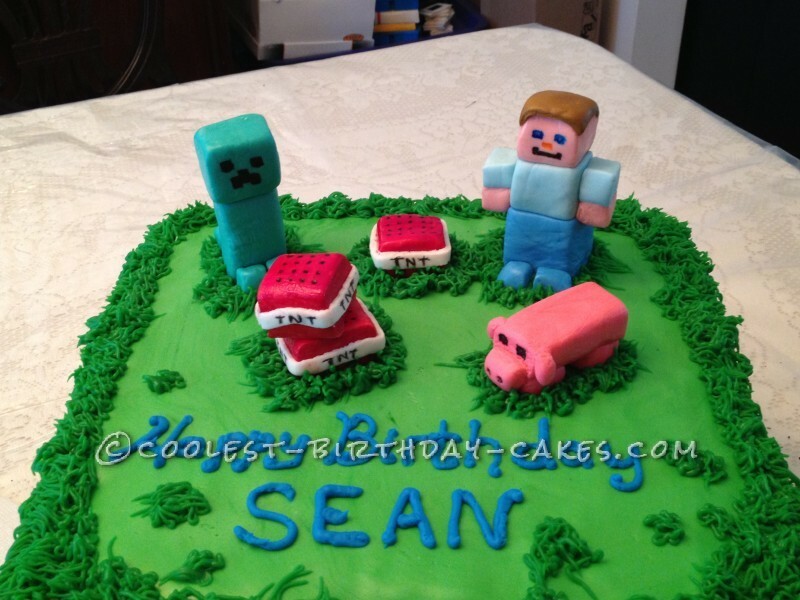 Then I placed my characters in place and used some green colored butter cream and a grass tip to “glue” them in place and hide the edges of the green fondant layer. The cake was a great hit! Kids and parents both loved the look and taste of it!